Every moment of every day, you have a choice to make. You can either let the minutes pass you by or you can claim them for what they are: opportunities to unlock the full depth of life's potential. For Carlos Whittaker, renowned blogger, musician and worship leader, and husband and dad, living deliberately is a way of life. Making moments that are significant, memorable, or impactful are a part of how he navigates each day, and it has forever changed the landscape of his story. 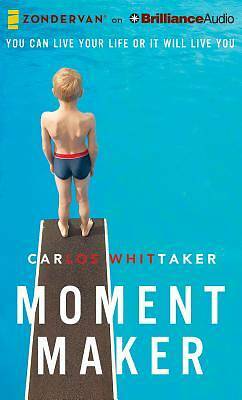 In Moment Maker, Carlos explains his methodology for living intentionally and claiming moments that touch the lives of others, whether that be his family, his friends, his colleagues, or total strangers. Carlos isn't asking anyone to make a big investment in time, energy, or money. He is simply uncovering the investment of attention. You don't have to buy tickets to special events or orchestrate elaborate surprises. You just have to be aware--of your surroundings, the people you encounter, the things that interest those important to you, the opportunities that present themselves--and be prepared to seize those moments and see lives changed.